Recently, a few of you have asked what kind of camera I use - today I will spill the details. A little background: I have always been interested in photography and took a couple of courses in college. Since getting my DSLR (digital single lens reflex) camera I have been taking classes at a local photography museum. I think the equipment absolutely can matter, but there are also many techniques and compositional aspects that can improve your photos on any camera - even a cell phone. I hope to share some more photography "how tos" on this blog in the near future. Some of the benefits of a DSLR camera include: the ability to change lenses (there are a few point-and-shoot cameras that are now offering detachable lenses), the manual capabilities which provide full creative control and allow you to tell your camera exactly what to do and lastly, the crispness of photos that a single lens reflex offers. Now, on to what I use... 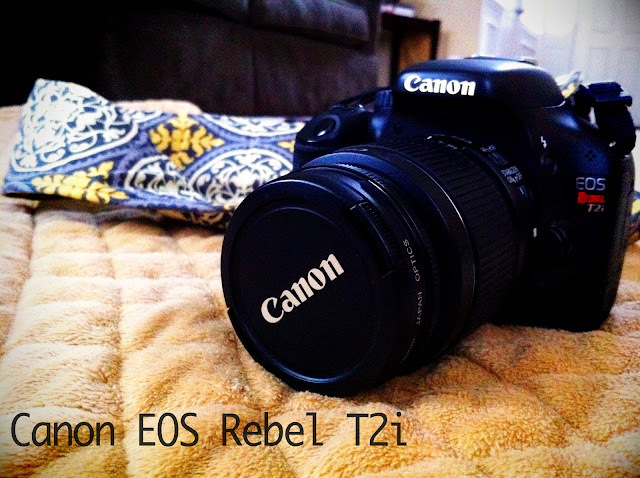 I have a Canon EOS Rebel T2i. I have found this to be a great entry-level DSLR camera that is more affordable than some of the higher-end DSLRs. If you do not already own any lenses, I would recommend buying a DSLR camera with a lens kit included. This will be a lot less expensive than purchasing the lenses separately up front. My camera kit came with a good "every day" wide angle lens of 18-55mm and a telephoto lens of 55-250mm. 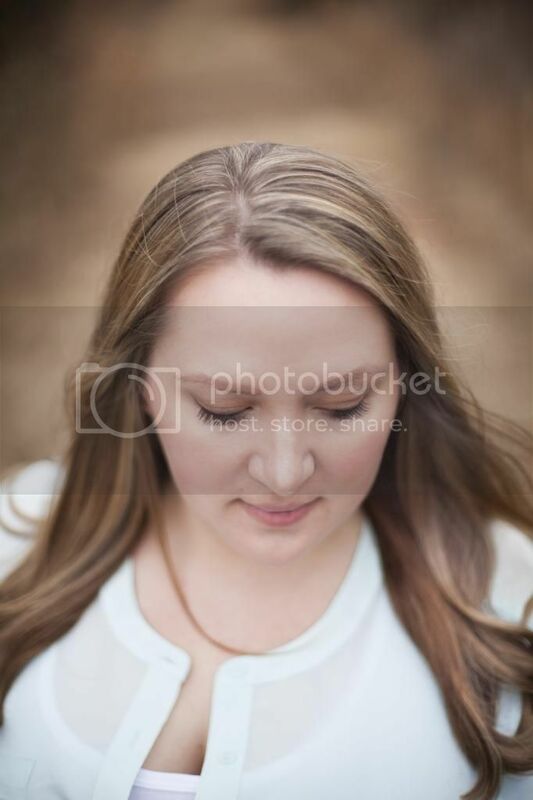 My favorite lens is my 50mm 1.8 prime lens. 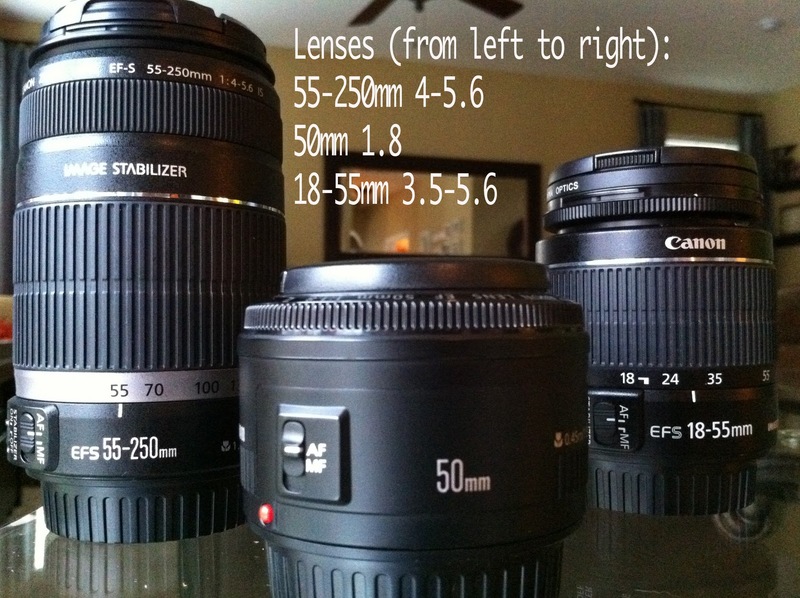 In many cases, a decent lens can cost as much or more than the camera body. Not this puppy, I got mine for about $100 and I have seen them available for cheaper. Why is this lens so great you ask? The "1.8" in it's name refers to the maximum aperture size (or minimum number). The smaller the aperture number i.e. 1.8, the larger the aperture size, confusing I know. The 1.8 aperture allows you to take photos with the often sought after shallow depth of field (blurred background with the subject in focus). Since the lens is prime (does not zoom) it forces me to move around to create the composition that I am looking for in my photos. I recommend buying one of these if you are on a budget but want the ability to take more creative photos. My camera strap (pictured above) was found on Etsy from the shop A Diva & Three Dudes... I love it because it slides right over the strap that came with my camera, it is padded - which is a lot more comfortable on my neck and it has a small pocket to put lens caps in while I am taking photos. I have a photography related wish list a mile long, starting with an external flash that I am hoping to purchase this week. I have seen the difference that it can make in photos and hope to share this with you once I start using it. So, now you know what camera I use... Do you have any photography related questions that you would like me to take a stab at in my next post? to my camera bag a 50 mm f/1.4 and an all purpose lens that I love, the Canon L series 24-70mm f/2.8 which you can find here. Yay photography tutorials! Amazingly enough, I learned all about photography on an old-school Minolta film camera, from the setting on the camera, to film development, to dark room, but I never transitioned my knowledge to digital. My goal is to learn how to use the Manual setting, but I understand that is opening up a can of worms. I would love to know more about how to make your photos so crisp and clean. That is something that can't really be fixed using editing software. DSLR, baby! I love it. Now I just have to learn how to use it.